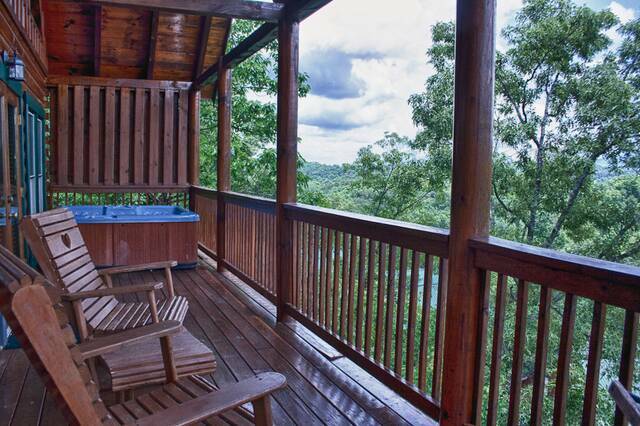 A beautifully romantic Pigeon Forge honeymoon cabin rental with all the amenities you want in a cabin....private Hot Tub on back deck, large Jacuzzi Tub and fireplace in bedroom, Game Room upstairs with Pool Table, and unbelievable views from the cabin! You'll love High Hopes! Planning a romantic escape or your honeymoon? 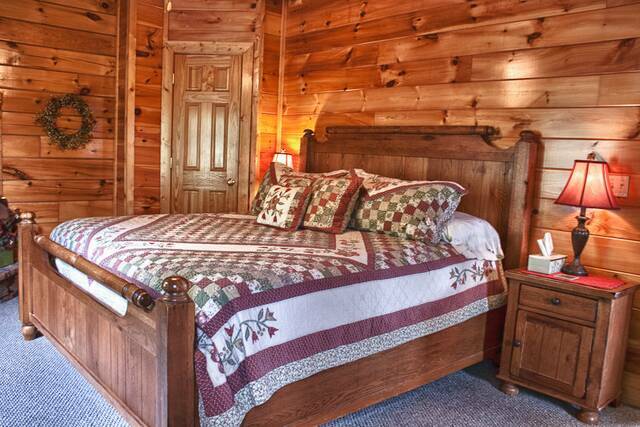 This Pigeon Forge Honeymoon Cabin Rental is the perfect choice. 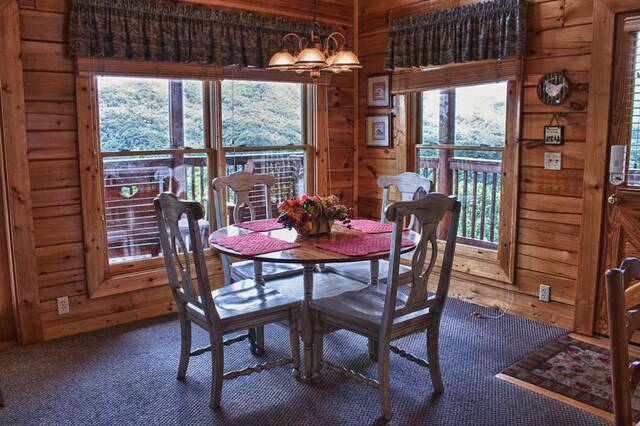 Located in Sherwood Forrest, this Pigeon Forge log cabin rental will be your go to place to escape to the mountains for years to come. As you enter the cabin, you are greeted by an open floor plan. Enjoy the mountain views from the kitchen, living room, or dining room. 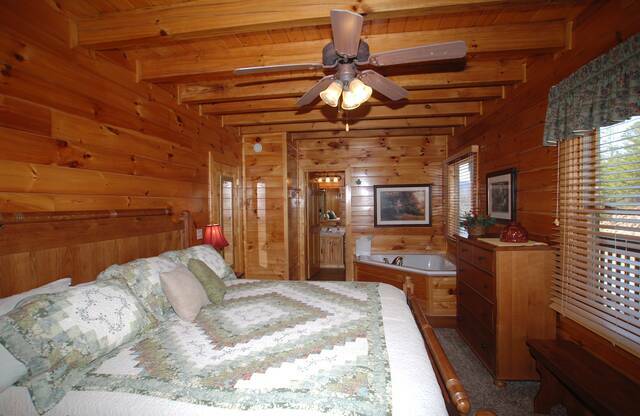 Also located on the main level is the bedroom which includes a King Sized bed, Electric Fireplace, and Jacuzzi tub. 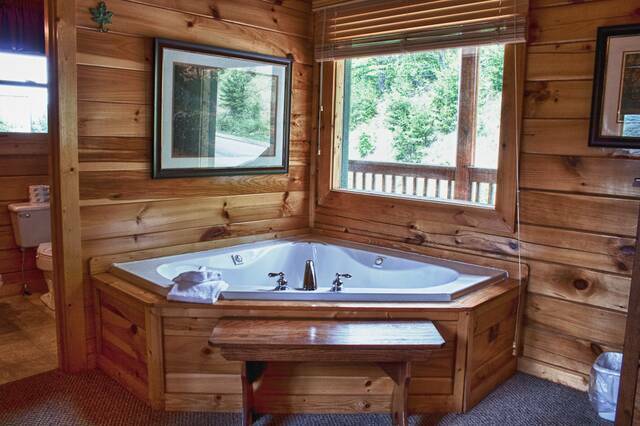 After a day of hiking in the Great Smoky Mountains National Park, kick back and relax in the outdoor hot tub. Enjoy the views that surround you. 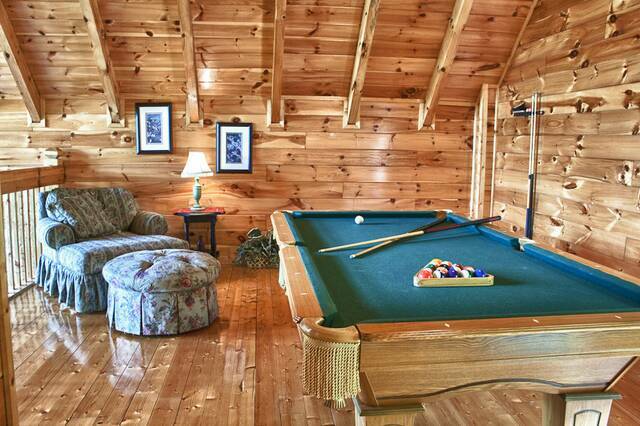 Upstairs in the loft area, challenge your mate to a game of pool. Relax, you are on mountain time. Main Level: 1 Bed/1 Bath 4 steps to Entry. Enter into kitchen on left, dining area to right, living room straight ahead. Living room has flat screen TV/Comcast/DVD/VCR, gas fire place, sofa, porch access with hot tub and gas grill. Closet off kitchen has washer/dryer. King bedroom (carpet) Jacuzzi in room, fireplace, closet, dresser, box TVComcast/DVD/VCR, full bath with tub/shower combo. 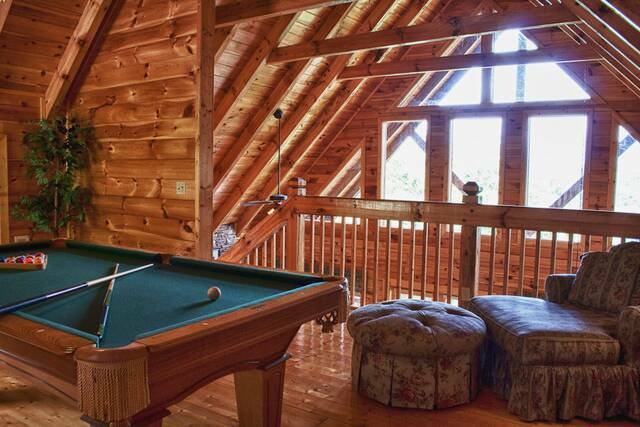 Upper Level: Loft with pool table and small chair and ottoman. All Roads Are Paved To This Cabin. Excellent cabin. Very clean. Great location. Staff at the rental company are very friendly and helpful. From beginning to end, our experience was great!Booking was easy and the person we spoke to was professional, courteous and a joy to talk to. The cabin was in a great location, easy to get to and close to all that is available in Pigeon Forge, surrounding towns and, of course, the Great Smoky Mountains. The cabin was perfect for two with plenty of space and beautiful views of the mountains. I will definitely stay here again! Management Response: Thank you for the lovely review. It was a pleasure having y'all stay with us this year and we look forward to having y'all back again next year! 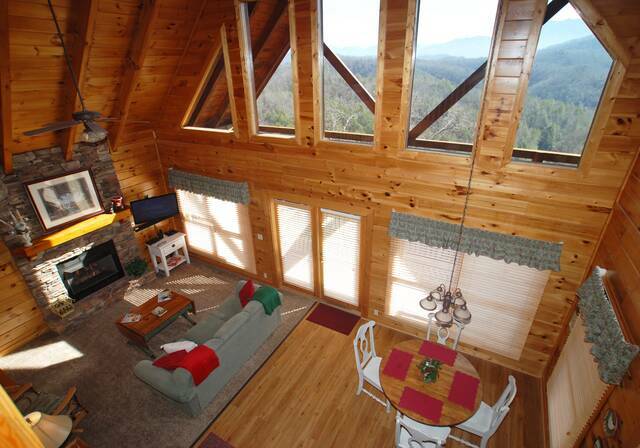 High Hopes is a beautiful cabin with breathtaking views of the mountains. We love the Sheerwood Forest Resort and the fact that this cabin is only minutes from some of the main attractions in Pigeon Forge. Management Response: Thank you for taking the time to review your recent stay with us at High Hopes. It was a pleasure to have y'all stay with us and we look forward to seeing you again next year. My husband and I stayed at high hopes for our one year anniversary. The house was absolutely perfect! The view is spectacular and the house had everything that we could have asked for! 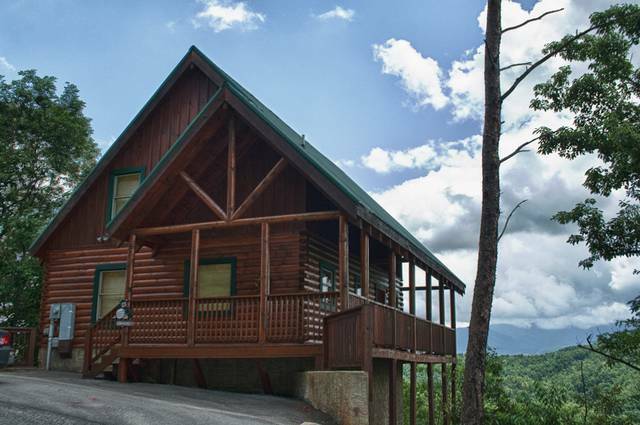 We loved being only a few minutes from all the attractions in pigeon forge yet the cabin offered the perfect romantic getaway with wonderful views of the mountains. We will definitely have to visit high hopes again soon! Management Response: Thank you for taking the time to review your stay at High Hopes and thank you for letting us be a small part of your anniversary celebration. It was a pleasure having y'all stay with us and look forward to seeing you again next year! My first time smokey mountains was the greatest vocation I have had in my life I can't imagin how beautiful view I saw when I woke up every morning. The cabin was very very awesome in and out. Management Response: Thank you for your review. We are so delighted you had a great stay and made so many wonderful memories at the High Hopes cabin. Glad we found your ring and were able to get it back to you. Looking forward to seeing you again in the future! Had a really good week. Loved the cabin and the view! Will stay here again for sure! Management Response: Thank you for the review of your recent stay at High Hopes. 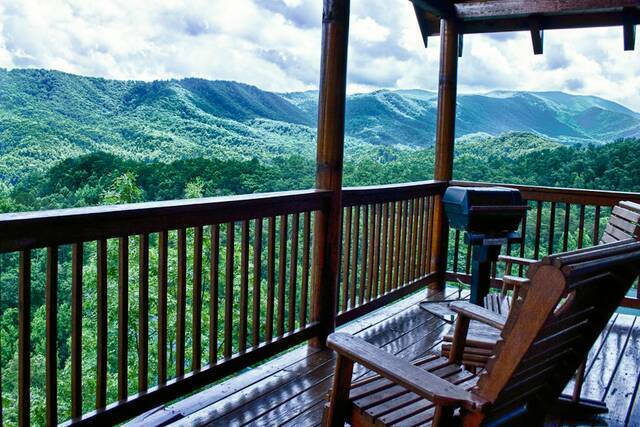 Yes, this is a great cabin, convenient with a wonderful view. We look forward to hearing from you and having y'all stay with us again soon. High Hopes cabin was great! The staff at the rental office was very friendly and helpful when I called for confirmation of details before the trip and when we arrived to pick up our welcome packet. 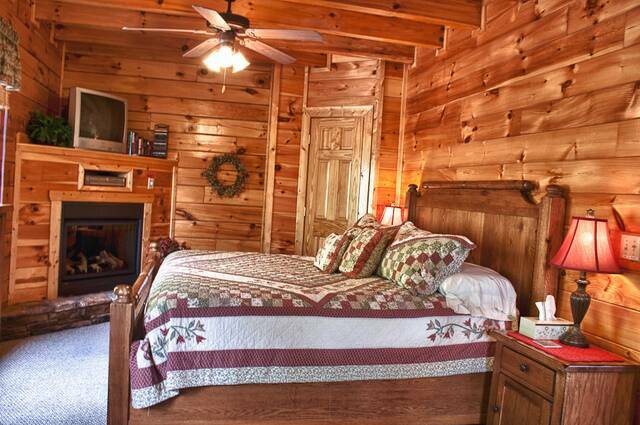 High Hopes is a cozy little cabin perfect for two. Everything was clean and in good working order. The view was amazing and exactly as pictured on the website. We spent our mornings on the deck drinking coffee and taking in the view. The cabin was remote enough that you felt secluded but only a 10-15 minute drive to all the action on the main roads. My only suggestion would be better furniture outside so guests can comfortably enjoy the view - the wooden chair started to hurt after a bit! Other than that my only complaint is I couldn't stay longer. I was very sad to leave and would love to visit again! Management Response: Thank you for reviewing your recent stay at High Hopes. It was great to finally meet you at check in. I will be sure to pass the patio furniture suggestion to the cabin owner. We sure look forward to seeing you all again one day! Wonderful vacation at High Hopes. We were a little leery at first since this cabin is in a community and being so close to Pigeon Forge; however we had no issues once we arrived. It felt very private even with other cabins nearby. The nights were peaceful and quiet and best view of Mt. LeConte of any of the cabins we have stayed in. The interior was nice, clean, and comfortable. We ended up appreciating the proximity to Pigeon Forge compared to cabins in the past as well. Overall, a wonderful time and would stay here again in the future. Management Response: Thank you for taking the time to review your stay at High Hopes. We are so happy you had such a great time. Looking forward to seeing y'all again! Management Response: Thank you so much for taking the time to review your stay at High Hopes. It was a true pleasure to have y'all stay with us and looking forward to seeing you again one day!! The rental cabin and view was AMAZING. The cabin was clean, nicely decorated and full of amenities. The view was the best part. We had no problems with wildlife. Diana was very helpful in guiding us around the area. We will gladly come back! Management Response: Thank you so much for taking the time to review High Hopes. I am so happy to have met y'all! Glad you had such a wonderful time and looking forward to seeing you again one day!! My favorite part of my vacation was staying at High Hopes cabin. The view was beautiful and very tranquil on deck. The cabin was very clean and had a comfortable bed. The only thing I didn't really like was that the bathroom only was accessible through the bedroom other than that it was great! Management Response: It was such a pleasure having y'all stay with us! Thank you for taking the time to file the review. Looking forward to seeing y'all again one day! We did enjoy our stay at High Hopes. There was construction going on above us that began every morning at 8 am. And some heavy equipment trucks that came by the cabin which were very loud. The view from the deck was nice and the cabin itself was nice. We appreciated all the things provided such as coffee filters, dish soap, etc. We didn't use the hot tube because it had a musty smell. I was surprised that in all the reviews people raved about how clean the cabin was. For the most part it was however I found numerous places that weren't clean. It was disappointing. I don't know if the rental place inspects and touches up the cabin in between renters if there is no one there for an extended period of time. It would have been nice to have a courtesy email or call from the rental office since we arrived on a Sunday. Despite my few complaints we had a nice time for the price we paid to stay. Management Response: Thank you for taking the time to give us feedback from your recent stay. We are always looking for ways to improve where it it needed. We do note in your confirmation papers that are emailed and the same check in papers you sign upon arrival that if you have any housekeeping or maintenance issues to please call our front desk. Should you have called the office about any housekeeping/maintenance concerns, we would responded immediately. We do not wish to disturb our guests while they are on vacation. This is viewed as a double edged sword as some would like the contact and some get very upset with the intrusion. We assume if we do not hear from a guest during their stay, everything is good and they are enjoying themselves. The cabins are checked the day of or the day prior to your check in. We sincerely appreciate the fact that in spite of any shortcomings you are still willing to visit and recommend us to others. Thank you so much for that vote of confidence, it means a lot to us. We hope to see you again soon! We stayed at High Hopes in July 2015. The cabin was clean, comfortable and very nice. 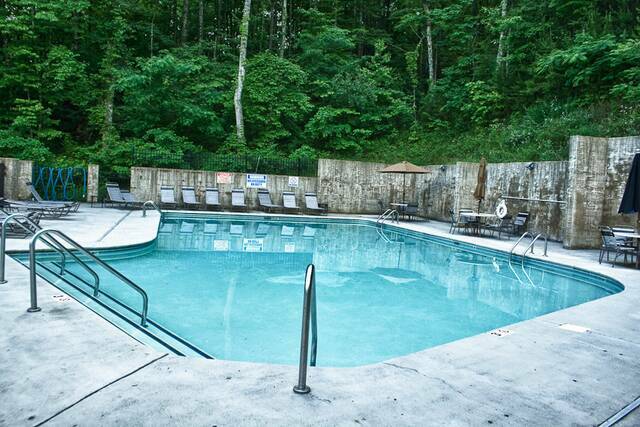 The location is excellent as 10 minutes from Pigeon Forge. The views are wonderful! We saw a black bear with 3 cubs in the cabin resort on several occasions--what a treat! We will return to High Hopes again in the future and had a wonderful vacation. Management Response: Thank you for the nice review. It was a pleasure to have met you and look forward to seeing you again one day! My husband I booked this cabin, and absolutely loved it! It was secluded just enough, but yet just a few miles from town. The scereny from the cabin was breathtaking! 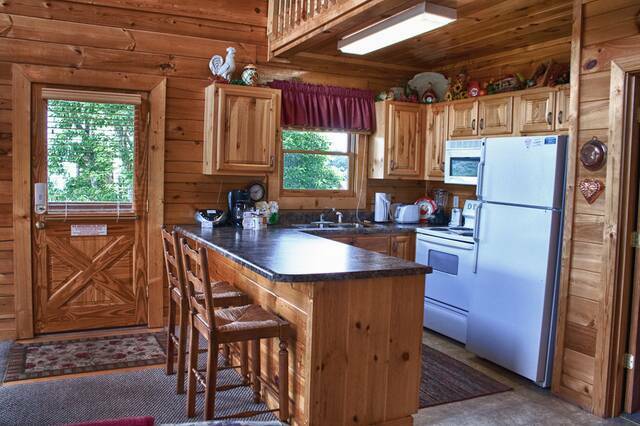 The cabin was clean and the owners left specific instructions so that we knew how to work everything. The owners also provided a welcome mug stuffed with items that was ours to keep. Great cabin! High Hopes cabin was everything we hoped for and more. We would recommend this to family and friends. The cabin had all of the accommodations of home without all the hustle and bustle. The Great Cabins in the Smokies staff was great to work with. They were very friendly. We were running behind getting to check in. They gave us a courtesy call to see how far out we were and then waited for us to arrive. This trip was everything we needed in a getaway. We are already looking to plan our next one. Management Response: Thank you for taking the time to give us feedback. We are always looking for ways to improve where it it needed. It was a pleasure meeting you and we are so happy you had a wonderful stay with us. We hope to see you again soon! My wife and I really enjoyed our stay at High Hopes cabin everything was more than we expected will rent this cabin again. The view was awsome really enjoyed sitting outside. Everything was great!!! A Big Bang for the buck. Management Response: Congrats! It was truly a pleasure meeting you and being a small part of such an important event in your new life together. Absolutely breathtaking! It wasn't as secluded as website made it out to be, but no complaints otherwise. It was quiet & peaceful. Cabin was very clean & we had everything we needed. The view was amazing! Needless to say we didn't want to leave. This was a time in our life when we needed peace and quiet and so the cabin was perfect.The scene from the deck is breath taking.we found the cabin to be clean and beautifully decorated with all the extra ammentities not found in all places we have stayed. It was also close to all the restaurants that we enjoy!! We loved High Hopes!! The cabin was clean and the view was awesome but they were doing construction on new cabins all around us so it was not peaceful and quiet. The cabins were close together so the picture is somewhat misleading but the cabin was cozy. The cabin company should have informed us of the construction at the time of booking so you had the option of changing to another area. We would return but only when all the construction is done in the area. Awesome mountain views. Cabin very well equipped with everything you could want or need. Very clean. Located in a resort but it still felt secluded and private. Staff was very helpful when checking in and answering any questions we had. Very relaxing vacation and pleased with everything!!! We absolutely loved this beautiful, clean, and home away from home type cabin. We will definitely be visiting this beauty in the future. It's such a convenient location yet such a magnificent view. It was a blessing to stay at High Hopes. Cabin was very nice.Might consider it again. Beautiful view. Very clean & comfortable. Jacuzzi tub & hot tub were very relaxing. I only have 1 complaint. The smoke detector upstairs beeped all night & we didn't get a very good nights rest. I also have one suggestion. The check in time should be earlier than 3pm. We would definitely recommend staying here & we will be back in the future. The whole experience was wonderful from begining to end. The cabin was wonderful and we did enjoy our stay. But, if we were not happy to discover it was located in a Wyndham owned resort. Was a wonderful 4 nights at High Hopes, cabin was the most well equipped one we have ever stayed in, view was great, hot tub relaxing, everything was spotlessly clean, wood highly recommend this cabin. close to town and many attractions! loved the atv rides in the mountains! This was our 4th stay in HIGH HOPES. The scenery is beautiful. The location is perfect. It only takes about 4 minuets to get to the main road. we even saw a bear once. Perfect for the couple that wants some alone time. Our awesome vacation started with very friendly staff from "Great Cabins" and ended with an amazing cabin in the mountains. We loved the cabin and the view was breathtaking. I took so many pictures because it continually took my breath away. Even though you have close neighbors in the neighborhood, it is still quiet and private. We went to Pigeon Forge for groceries and I do not recommend staying there for long as it is crazy busy and the traffic is terrible. 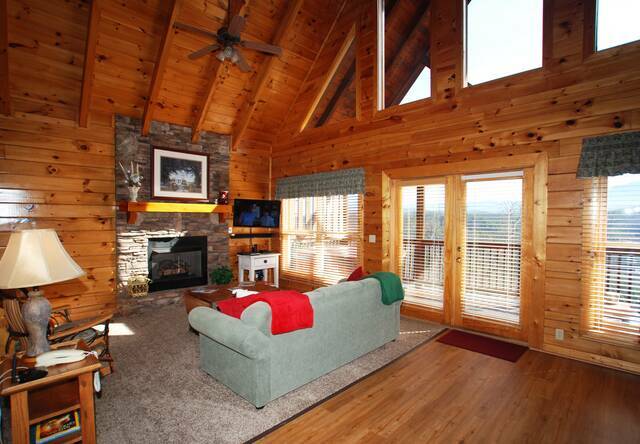 I would highly recommend these cabins and "Great Cabins in the Smokies"! Management Response: Thanks! And we agree about Pigeon Forge traffic being nuts in July! Lots of people discovering the Smoky Mountains! 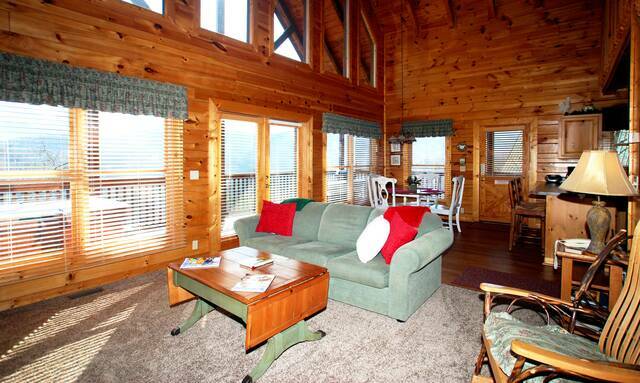 The cabin was fantastic with a breath taking view of the Smoky mountains. I would use this cabin again. We really had a great time the cabin was really nice and better than I expected I would go again. Thanks for everything. !!! Great view of the mountains and a wonderful location close to town. We had a great vacation experience. My husband needed to get away and it was just what we needed. He spent lots of time on the deck just resting and taking lots of pictures of the mountains and sunrises. Very relaxing. Will definitely do it again!! My original cabin was a secluded getaway for two. Unfortunately, the phone line did not work which would not have been a problem if I had cell phone coverage, but I liked the segregation. Second the jacuzzi had a leak. Once management was informed the have us a significant upgrade. My problem was the upgrade was in more of a resort like area rather than the seclusion me and my wife planned for. Loved the cabin, great views!! The only thing that I would have liked to see was updated furniture and TV's. The couch and chair were not very comfortable. Everything else was top notch! The rental company was super easy to do business with, we couldnt get the fireplace lit the first night and 1 phone call and 15 minutes later a work was at our cabin to fix it.